Florida Adventures: Fakahatchee Stranded By Russell Kelley A misadventure while traveling through the Fakahatchee Strands. Kelley describes what should have been a scenic drive as one that we all will remember. By Lt. Colonel Danny M. Johnson, USA-Ret. The history of Camp Murphy, also known as the Southern Signal Corps School is a story full of camouflage, concealment, and isolation of a highly classified program that was hidden from the public, and ultimately the enemy. Mary Duggett Benson and her Iconic Worth Avenue Gallery By Deborah Pollack Pollack explores the life of Mary Duggett Benson and her efforts to bring the Worth Avenue Gallery to life. A 1943 photo of Camp Murphy staff members. Front row: Ebeling, Silvasy, Haynes, Gehringer, Cross, and Coleman. Back row: Chalmers, Keck, Guyton, Anderson, Olson, and Abbey. Photo courtesy HSPBC Archives. From the Editor Dear Reader, Recently we received a wonderful surprise in the mail, an article from On Point Magazine, "A Journal of Army History," about Camp Murphy in northern Jupiter. The article had spiked the interest of our former education curator, Tony Marconi, who sent it to our editor-in-chief, Debi Murray. Camp Murphy was a secretive training ground during WWII, a pivotal step for our military in gaining ground to win the war. The article is reprinted here. This Spring issue also includes an article on the fascinating life of Mary Duggett Benson and her devotion to the establishment of the Worth Avenue Gallery. It seems that creativity is in the air this spring, as we received a fascinating account of a misadventure to the Fakahatchee Strand State Preserve. One of our board members, Russell Kelley, tells a humorous account of a wild ride his family took while they explored Florida. Have you found yourself with an interesting story? We would love to hear about your own "Florida Adventure" for this new occasional series! I hope you enjoy this issue, and do let us know if there are any topics you would like to see covered in the future. We are always looking for fresh, informative, and entertaining articles. 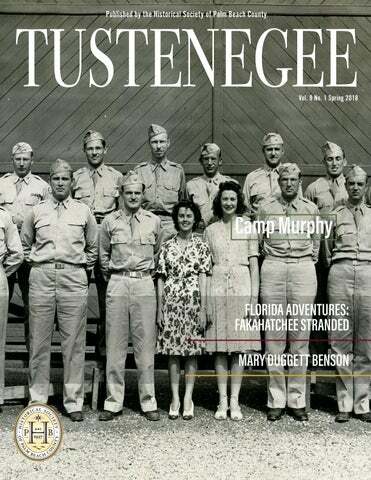 The Tustenegee is a journal about Palm Beach County and Florida history and is published online twice a year by the Historical Society of Palm Beach County. 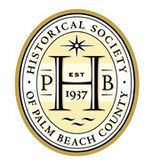 The Historical Society of Palm Beach County is a non-profit organization whose mission is to collect, preserve, and share the rich history and cultural heritage of Palm Beach County. Historical Society of Palm Beach County 300 North Dixie Highway West Palm Beach, FL 33401 Phone: (561) 832-4164 Fax: (561) 832-7965 www.hspbc.org www.pbchistoryonline.org Mailing Address: Historical Society of Palm Beach County PO Box 4364 West Palm Beach, FL 33402-4364 The contents of the Tustenegee are copyrighted by the Historical Society of Palm Beach County. All rights are reserved. Reprint of material is encouraged; however, written permission from the Historical Society is required. The Historical Society disclaims any responsibility for errors in factual material or statements of opinion expressed by contributors. The contents and opinions do not necessarily reflect the views and opinions of the editors, board, or staff of the Historical Society of Palm Beach County. Florida Adventures Fakahatchee Stranded By Russell Kelley Fakahatchee Strand. Photo courtesy Russell Kelley. This recent submission to the Tustenegee involves an adventure on a scenic drive alongside the Fakahatchee Strand State Preserve in southern Florida. The editorial staff so enjoyed the article, which brought back many memories of misadventurous Sunday drives, that we thought it would be fun to start a new occasional column entitled “Florida Adventures.” We hope you enjoy it as much we have and that some of you will share your own tales. Have you taken a drive in new territory and heard the soft sounds of banjos coming from the woods? We want to hear about it! Or perhaps you’ve got a favorite drive that no one else seems to know about that you’d like to share with our readers. Write it up and send it in (with pictures, if possible)! Don’t limit yourself to car rides – think about bike rides, hiking adventures, or just an unusual walk in your neighborhood. Humorous tales are welcome! Janes Memorial Scenic Drive, which turned out to be a narrow dirt road. With a name like that, we had expected something a little more substantial. We later learned that the road had been a railroad bed in the 1940s used for logging the Fakahatchee’s oldgrowth cypress trees. Entering the Fakahatchee Strand. Photo courtesy Google Maps. The Kelley Family: Phelps (left), Russell (center) and, Lynn (right) on another adventure. Photo courtesy Russell Kelley. were making a last sweep of the day to make sure no tourists were stuck in the strand overnight? Or were they swamp dwellers intent on stealing our Prius and feeding us to the alligators? My wife, recalling what happened in Deliverance, yelled, “Whatever you do, don’t stop! Keep driving!” As we got closer, it became clear that the vehicle with the headlights on was not moving. As we got closer still, we could tell that it was neither the kind of SUV that park rangers would drive nor the kind of rusted pick-up truck that swamp dwellers from Deliverance would have. It was, in fact, a Toyota Corolla. We pulled up to warn the driver not to proceed any further. Sitting in the car were two middle-aged women with binoculars trained on something high in the trees next to the road. Without lowering her binoculars, the woman in the driver’s seat said peremptorily in an English accent, “We are looking at a bittern.” Left unsaid: “Please go away.” So away we went. We made it out of the strand, but the tire pressure warning light on the dashboard started to flash and there was a strange sound coming from underneath the car. An inspection revealed that one of our tires was losing air and that something was hanging down from the undercarriage of the car and dragging on the road. We drove to a gas station in Everglades City, where we filled the leaky tire with air. We bought a roll of duct tape at the convenience store and managed to tape up the part of the undercarriage that was hanging down so that it no longer scraped the road. We limped back home, filling the leaky tire every half hour. Fakahatchee Strand State Preserve Map. Photo courtesy Google Maps. Prius is not designed for off-road driving.” The garage replaced the flat tire, installed a new splash shield, repaired both front fender liners, balanced and aligned the wheels, and cleaned the car. The bill came to $836.22. Next time we’re going to take the two-and-a-halfhour Fakahatchee Ghost Rider Tram Tour, which costs $25 a head. Picayune Strand. Photo courtesy Google Maps. time on this trail unless you’re in a tank.” I also did some research on why Picayune Strand State Forest has a grid of roads that resembles Manhattan. It turns out that the Picayune Strand was logged for cypress trees in the 1940s and 1950s. In the 1960s, after all the cypress trees had been cut down, 57,000 acres of swampland were purchased by Gulf American Land Corporation, which planned to build the world’s largest subdivision, five times the size of Manhattan with a projected population of 400,000. This project became the mother of all “swampland in Florida” scams. to thousands of buyers, but what looked like dry land in the winter was under water and swarming with mosquitoes in the summer. Gulf American eventually went bankrupt. In 1977, the State of Florida began the herculean task of purchasing vacant lots from 17,000 absentee landowners to create a wildlife sanctuary, but the old canals and roads are still there. The Florida Forest Service officially changed the name of Southern Golden Gate Estates to Picayune Strand State Forest in May 1995. ABOUT THE AUTHOR Russell Kelley was born in Palm Beach but moved away at age 12. When he moved back 50 years later, he and his wife started to discover south Florida, including the Everglades and Fakahatchee Strand. Between stints in Palm Beach, he praticed international business law in London, Tokyo, and Paris. He serves actively on the Board of Governors of the Historical Society of Palm Beach County. An aerial photograph of Camp Murphy taken in May 1942 shows its close proximity to the Florida coast. Due to the top-secret radar training conducted at the camp, the photograph was not released to the public until February 1945. Photo courtesy National Archives. Camp Murphy was named for Colonel William H. Murphy, a pioneer in the field of military radio. Murphy was killed in early February 1942 when the aircraft he was in was shot down by two Japanese Zeros. Photo courtesy Southern Signal Corps School, Camp Murphy, Florida. Army and Navy Publishing Company, Inc., 1943.
was already a state park, ideas for its use continued to pour in. In June 1953, the Palm Beach County Commission proposed using Camp Murphy as a site for a state mental hospital. In April 1954, Senator George Smathers proposed that Camp Murphy be made available as a potential site for the new U.S. Air Force Academy. None of these proposals were received favorably. A noteworthy achievement at the old Camp Murphy property was in the field of satellite tracking. Beginning in 1957, as part of the International Geophysical Year Satellite Tracking Program, the Jupiter tracking station was located on a piece of the old Camp Murphy property until it closed in 1967. In January 1987, a new system, the Jonathan Dickinson Missile Tracking Annex, went online and was certified to provide launch support for National Aeronautics and Space Administration launches. This state-of-the-art site “included four telemetry units, which provided inflight monitoring of launch vehicles performance, electronics, and associated subsystems.” The park’s role as a site for communications devices continued to be upgraded. Though decommissioned in 2010, a large Coast Guard LORAN (Long Range Navigation) tower that stood for many years was only recently dismantled. The Smithsonian Institution currently maintains a large telescope to track satellites on part of the park property. Soldiers are shown on a Camp Murphy radar tower during maintenance training. Photo courtesy Southern Signal Corps School Camp Murphy, Florida, Army and Navy Publishing Company, Inc., 1943. From its earliest beginnings with “wig-wag flags” during the Civil War to today’s use of integrated joint-service operations incorporating modern information technologies, the Signal Corps has come a long way. In its short history, Camp Murphy trained countless radar officers and thousands of radar technicians for the Army, Army Air Forces, Navy, and Marine Corps. Built as a quick solution to overcrowding and poor weather conditions at Fort Monmouth, Camp Murphy met the demanding requirements for highly classified and technical radar instruction and great weather for training year-round. Keeping what soldiers did everyday away from other soldiers, family members, civilians, and the press was paramount. The highly technical training that soldiers received at Camp Murphy spread to all parts of combat theaters throughout the world. ABOUT THE AUTHOR Lieutenant Colonel Danny M. Johnson, USA-Ret. worked as a civilian on the Department of the Army staff at the Pentagon, and as Command Historian for U.S. Army Information Systems Command and 5th Signal Command. He served a short tour in Operation IRAQI FREEDOM in 2003, documenting Signal Corps involvement in the invasion. As a private military scholar, he has made numerous contributions to On Point. He authored Military Communications Supporting Peacekeeping Operations in the Balkans (2000), edited The European Signal Corps Order of Battle (2001), and contributed numerous inserts for The Oxford Companion to Military History (2001) and Military Communications from Ancient Times to the 21st Century (2007). He currently resides in Sacramento, California. Mary Duggett Benson, 1924. Courtesy Library of Congress Prints and Photographs Division, photo by Arnold Genthe. he life of Mary Duggett Benson changed dramatically in December 1917, when she and the stage star Eva Le Gallienne fell in love. Born on March 30, 1890, to a devout Catholic New York family, Mary was nine years older than Eva, and nurtured and cared for the actress, especially in times of ill health and crisis. After a live-in relationship lasting around three years, in 1921, bowing to pressure from her family and society to adopt a more accepted relationship, Mary married the sculptor Stuart Benson. She and Eva remained intimate friends, however, and Eva would visit Mary and Stuart at their home, Folding Key Farm, in Weston, Connecticut. Note: From Palm Beach Visual Arts by Deborah C. Pollack, © 2016 by Deborah C. Pollack, used by permission of the publisher, Pelican Publishing Company, Inc. www.pelicanpub.com. Left: Eva Le Gallienne, 1920s. Photo courtesy Wikimedia Commons, photo by Nicholas Haz. Right: Alice De Lemar (left) and Mary Duggett Benson in Weston, Connecticut, 1933. Photo courtesy Library of Congress Prints and Photographs Division, photo by Arnold Genthe. many of them afloat but remain anonymous in her philanthropic activities. moment, artists have been painting for YOU!” She also assured potential patrons that her prices were moderate and that visitors were always welcome. as” the Worth Avenue Gallery. However, she still retained the partnership with Ned Mathews. There was no particular school that Benson selected—it just depended on a certain something possessed by an artist: “A painting must have an intangible part that you intuitively recognize as art,” she explained. “It is an indefinable, inspiration quality. And when you find it, the reward is a wonderful, exciting experience.” She “set standards” for later Palm Beach art galleries and offered the privilege to own a great work of art by an artist she believed in. As one artist put it, “Mary Benson doesn’t sell paintings, she allows people to buy them.” Critic Laurence Dame remarked, “Mary had heart, knowledge, and rare intuition” and considered the cause of art “sacred.” She believed that “the artist is the all important factor, not the gallery. The gallery is there simply to serve the artist and of course, the public.” And serve she did; so much so that she became known as “the first lady” of Palm Beach art. who later rendered the likeness of Caroline Kennedy; Channing Hare; and Mary MacKinnon (aka McKinnon) Johnson made up the gallery’s portrait painters, along with Mary Benson’s exhusband Stuart who provided portrait sculpture before he died in 1949. The Worth Avenue Gallery continued to thrive by exhibiting the beloved Orville Bulman’s whimsical renderings, New York modernist Gertrude Schweitzer’s paintings, and works by such artists as surrealist Jack Hawkins; glass designer Grover Hendricks; Hopkins Hensel; Ouida George, Patrick Archer (Graham-Eckes School Art Department Chairman); Paul Crosthwaite; John Sharp; and Piero Aversa. During the 1959-60 Palm Beach season Aversa exhibited his portraits of socialites and threw the show’s cocktail party reception, where Alice De Lamar conversed with the artist James DeVries, son of Mary MacKinnon (DeVries) Johnson. Sworn Affidavit by Mary Benson, signed December 18, 1958; filed February 2, 1959. Photo courtesy State of Florida Public Records. principal and Benson signed a sworn oath notarized by Virginia Smith for the State of Florida that Mary maintained “100% ownership” of the Worth Avenue Gallery. She was almost sixty-nine years old. While one could speculate that Alice De Lamar financially backed Mary’s efforts after Ned left the firm, Mary later asserted that the gallery had been continually self sufficient and never subsidized. However, there is no doubt that Alice, whose generosity extended to so many in the arts, financially supported Mary in various ways during her lifetime. De Lamar also became a magnanimous patron to some artists Benson discovered, such as Keith Ingermann, whom Mary befriended while he was a student exhibiting at one of her clotheslines shows; and the quirky Henry Faulkner, who taught Tennessee Williams how to paint. Faulkner usually created a stir when he strolled down Worth Avenue accompanied by his pet goat named Alice. (Left) Jean Bulman, Mary Benson, and Orville Bulman at the Worth Avenue Gallery, ca. 1963. Photo courtesy Bert and Richard Morgan. (Center) Henry Falkner with Peter portrait by Piero Aversa, February 1960. Photo courtesy HSPBC Archives. charms including an artist’s palette, and a chest full of Kennedy half dollars, signifying her warm relationship with the renowned family. After the gathering, in which tears were mixed with laughter, columnist Emilie Keyes, who called Mary “gallant and lovely,” wrote to Alice De Lamar, “Mary’s party was sweet but sad—I hate to see the end of an era—but am glad to have been part of it.” After Benson closed her gallery, George Vigouroux helped provide a showcase for art by De Lamar’s friends, but Alice did not particularly care for Vigouroux. Nonetheless, the two sustained a working, if not overly fond, relationship. Of course, if Alice had actually owned the Worth Avenue Gallery, secretly or otherwise, she would have simply hired a new director to run it, but since it had been Mary’s, Alice had no other choice. In 1972, Mary Duggett Benson, the woman who started the gallery boom in Palm Beach, died in a Miami nursing home. The Palm Beach Post correctly acknowledged her as the "founder and director of the Worth Avenue Gallery." In a letter to Alice De Lamar, artist Gertrude Schweitzer wrote that Mary “was a wonderful person, loved to be surrounded by good art,” and that “the Worth Ave. Gallery with Mary Benson has not yet been topped.” While Alice De Lamar remained a quintessential supporter of the arts until she passed away in 1983, her friend, Mary Benson, should forever be remembered as the rightful owner of the iconic Worth Avenue Gallery and the woman who put Palm Beach on the art gallery map of the world. The success of any organization relies on leaders with a strong commitment to its mission, who serve as ambassadors and inspire others. In addition to the benefits of general members, Benefactors receive invitations to all lectures and special events (typically free), a book from our Museum Store, a copy of a historic photo from our Archives, an exclusive Benefactors Reception in Palm Beach, and your name on HSPBC letterhead. Our Pioneer Circle members recognize the challenges of our forefathers, who inspire our shared civic pride. In recognition of this support, you will receive invitations to all lectures and special events (typically free), a book from our Museum Store, and a copy of a historic photo from our Archives. Celebrate the vision of Henry Flagler in developing this special community by the sea through your support. You will receive invitations to all lectures and special events (typically free), and a book from our Museum Store. Like Addison Mizner, you can help change the face of Palm Beach County. You will receive invitations to all lectures and special events (typically free), and a copy of a historic photo from our Archives. Make your community stronger by helping to provide free admission for all to the Johnson History Museum. You will receive invitations to special events, such as the private opening receptions for new exhibits. As vital as all our levels is this foundation of support from singles and families, needed to continue operations at the HSPBC and the Johnson History Museum. All Members are entitled to free research from the Archives and Library, by appointment. Pioneer Circle ($1,000) Mr. & Mrs. Jeffrey Alderton Ms. Jane Beasley Mr. & Mrs. Gary Burkhead Mr. & Mrs. Robert Forbes Mr. & Mrs. Mariano Garcia Mr. & Mrs. Jeremy Johnson Mr. & Mrs. Charles H. Jones Jr. Mr. & Mrs. Berton E. Korman Ms. Carey O'Donnell & Mr. Stephen Barry Drs. David B. & Leighan Rinker Ms. Caroline Sory Mr. & Mrs. Timothy S. Sotos Mr. & Mrs. David J. Thomas III Mr. & Mrs. William H. Told Jr.
Ms. Elaine Ragon Mr. Tanner Rose Mr. & Mrs. E. Burke Ross Jr.
Let’s Get Social! Visit us online and stay up-to-date with what’s happening at HSPBC. Volunteer: Make a Powerful Difference to Others (and to Yourself!) by Rhonda Gordon Volunteering is an enjoyable way to explore your interests and passions and provide mental stimulation that can transfer into your personal and professional life. Volunteer work has many benefits for you and those you serve: •	It enriches the lives of others. •	It can help strengthen ties to the community. •	It exposes you to people with common interests. •	It can provide a warm environment to depart from your day-to-day routine. •	It is a great way to meet new people. Annual Salute to Volunteers Luncheon. Photo courtesy HSPBC Archives. In today’s world, our routines have become consumed by our daily schedules—the sheer thought of donating time can seem overwhelming. One of the best advantages of volunteering, however, is that YOU decide when and where to spend your helping time. Although volunteering is unpaid in financial terms, nothing about it is valueless. Many volunteering opportunities provide extensive training that help you build upon skills you already have, and teach how to utilize those skills to benefit the greater community. Left to right: Archival assistant, Community Outreach, Museum greeters and docents, and Museum Store assistant. Photos courtesy HSPBC Archives. Annual field trips: Volunteers visit (left and center) the Ann Norton Sculpture Garden and (right) the agricultural district of Palm Beach County. Photos courtesy HSPBC Archives. Regardless of one’s age or circumstance, there are opportunities to volunteer at the Richard and Pat Johnson Palm Beach County History Museum, operated by the Historical Society of Palm Beach County. You can assist at special events, greet museum visitors, or help customers in the Museum Store. If you want to go ‘all in,’ you can study to become a museum docent or help with research and the archival collection. In whatever capacity we agree on, you can make a powerful difference! People who volunteer say the experience creates a euphoric feeling inside, noticeably improving their health and wellbeing by giving of themselves to benefit others. Our volunteers at the Historical Society of Palm Beach County are truly the best. Their diverse backgrounds in education, profession, experiences, skills, and residency make for quite an extraordinary team. Without their involvement, the HSPBC staff could not effectively further its mission. We would welcome your consideration of joining us. The difference that you will make in someone else’s life will make an even bigger difference in YOURS! Docents lead tours for all ages. Photos courtesy HSPBC Archives and Capehart Photography. To learn more, please contact Rhonda Gordon, Volunteer and Outreach Coordinator, at 561-832-4164, ext. 110 or rgordon@hspbc.org. Annual Membership Meeting Tuesday, April 24 Meeting and reception open to all current members of the Historical Society of Palm Beach County The Great Give Tuesday, April 24 Join us on this annual day of online giving and help us meet our goal of $50,000! Armed Forces Day Saturday, May 19 Annual Armed Forces Day event. Help us celebrate our veterans and touch a truck! Photographic Collection Photo courtesy HSPBC Archives. Built in 1895 to accommodate railroad and pedestrian traffic, the F.E.C. Railroad bridge once stood to the south of what was the Royal Poinciana Hotel (left). The tracks bisected Palm Beach and terminated at the end of a steel pier, which serviced steamship travel to the Bahamas and Cuba. Upon the completion of Whitehall (right), Flaglerâ&#x20AC;&#x2122;s wedding gift to his third wife, Mary Lily Kenan, the bridge was moved to the north side of the hotel. The HSPBC recently collected an oral history from Jane Hadley Caruso, granddaughter to William Fremd, the landscape master for Henry Flagler at his Palm Beach properties. She remembers her grandfather well and had great memories to share about early Palm Beach and West Palm Beach. As we discussed World War II, Caruso said that she had volunteered at the V for Victory Canteen at the northwest corner of Worth Avenue and South County Road. The two girls in the photo above are (left) Jane Ann (Hadley) Caruso and best friend (right) Jean Anne Daley. Photo courtesy HSPBC Archives.